The Pathbrite integration of Credly enables learners to easily add badges they earn, share and store on Credly to their academic and professional Pathbrite portfolios. Pathbrite is the leading Portfolio Learning Platform and is used by institutions like Fresno State University, Laureate International Universities, Stanford University, and University of Illinois. 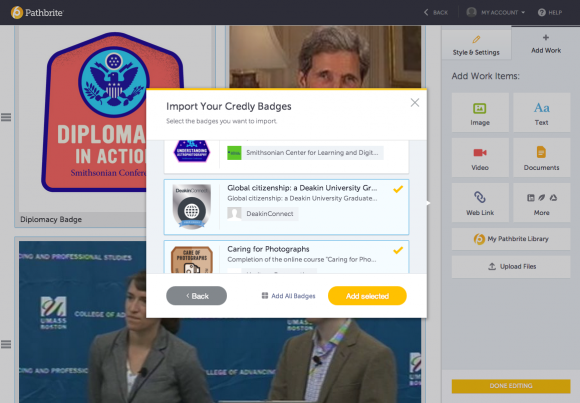 With Pathbrite’s integration of Credly, learners can display digital badges and credentials with the other important artifacts in their personal portfolio. 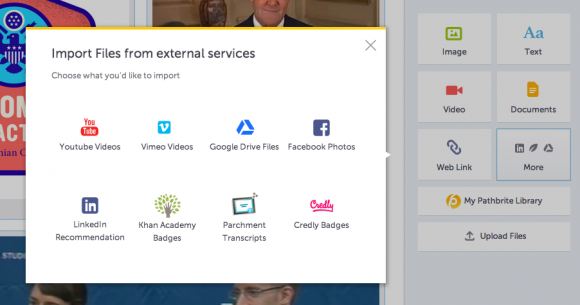 Pathbrite lets users showcase a holistic view of their skills and achievements by importing evidence from popular web services, such as YouTube and Vimeo videos, LinkedIn recommendations, Google Drive files, Facebook photos, Khan Academy achievements and -- through this integration -- Credly badges. Portfolios are reviewed by instructors as part of an evidence and competency-based approach to learning, as well as by colleges and universities considering candidates for admission and employers evaluating individuals for job opportunities. With thousands of organizations issuing digital credentials and Open Badges through Credly, learners using Pathbrite now have a wealth of new sources of evidence of achievement they can make visible to those reviewing their portfolios. The Pathbrite / Credly integration is available today to all Credly and Pathbrite users.